1Department of Human Genetics and Molecular Biology, Bharathiar University, Coimbatore, Tamil Nadu, INDIA. Phytotherapy is the traditional method used to cure many diseases. Various medicinal plants found in many parts of India are well known for their various medicinal values. The Terminalia chebula Retz. a native plant of Asia is found to have various properties like anti-oxidant and free radical scavenging activity, anti-carcinogenic activity, ant-imutagenic activity, anti-bacterial activity, anti-fungal activity, anti-viral activity, anti-diabetic, renoprotective activity, cardio-protective activity, anti-inflammatory and anti-arthritic activity. 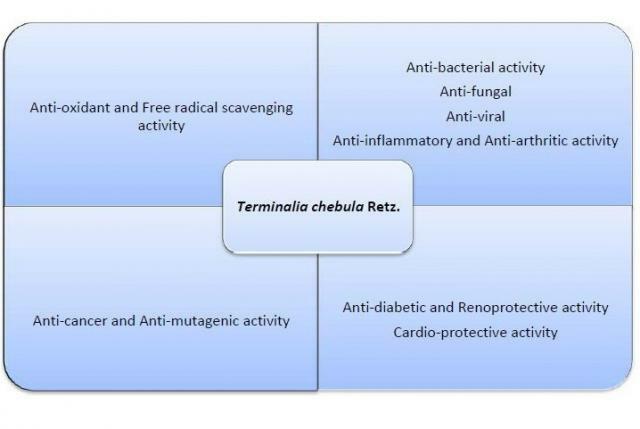 These properties of T. chebula discussed in this review are mainly due to the presence of various types of phytoconstituents. Hedina A, Kotti P, Kausar J,, Anand V. Phytopharmacological overview of Terminalia chebula Retz. Pharmacognosy Journal. 2016;8(4):307-309.